College football Twitter bans unconstitutional? ESPN reporter says it seems that way. 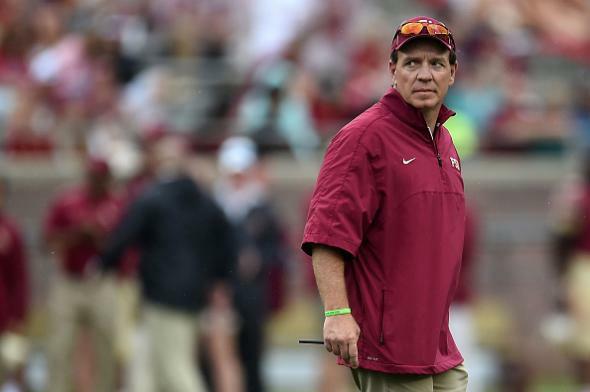 Florida State football coach Jimbo Fisher in April. But what about the other restrictions on behavior (enforced curfews, practice schedules, etc.) that athletes have long agreed to? “Unlike social media bans, those rules don’t invalidate their constitutional rights,” Kimes writes. In other words, perhaps, no one has a constitutional right to sleep in. For a longer take on the issue, here’s a 2012 article from the law review published by … Florida State. “In order for these bans to be constitutional, the schools and coaches would have to show that the banned speech either has disrupted or would substantially disrupt school operations,” writes author J. Wes Gay after reviewing the relevant precedents, asserting reasonably that very few athletes’ tweets could be imagined to meet that standard. *Correction, Sept. 2, 2015: This post originally misstated that the football player in question had followed my friend’s account.